Join the AO forum! There's a special subforum just for Nature Study. Question: Is the point of nature notebooks to draw well, or to study nature? There are a couple points to drawing in a CM style program. One is that we want all students to feel comfortable working with tools, including pencil and drawing paper. The second, and really more important, I think, is that the drawing is merely a tool that helps develop the skills of observation. The point is that they learn to observe and notice detail, and do so carefully. Sometimes it helps to draw out the observation skills by asking questions (Comstock Nature book is good for that) that require the child to slow down and notice. Working at drawing what one actually sees rather than what one thinks is there is also useful for hand-eye coordination. My children are 12, 8, and 4. We've been going outside most every afternoon since the oldest was a newborn. The most difficult time was when we lived in one particular apartment and it was three flights to the teeny, tiny patch of grass on a city alley. It has become a way of life with us, but at the most difficult times (newborn babies, recovering from miscarriages and surgeries) we made it a point to "just do it." We pick up and go - if it is only for 30 minutes, then that is better than nothing. 30 minutes every 7 days a week over those difficult weeks/months really adds up too! I also found I crave the outdoor air and walking exercise and need it to clear my head and think a bit. We don't have a car during the day, so we've always been limited to places within walking distance. Our previous house was in a town with a library nearby on a tiny little wooded lot, so we went there often to gather leaves and watch the squirrels. For the past two years, we've lived in a plan - fresher air, safer neighborhood, bigger house - but less to do without a car. So, we walk around the plan - there are two or so empty lots which give us a little nature, we have some trees behind our house, and many of the people in the neighborhood have interesting trees and flowers to look at. Our neighbor has an English type garden with butterfly bushes and flowers and a tiny little garden-pond, this gives us interesting things to watch all day. For five years we lived in an upstairs condo with nothing but a fairly busy parking lot to play in, so I can certainly appreciate feeling like a prisoner in one's own home. I didn't have a vehicle at the time, either. I prayed hard for God to find us a home with a fenced yard and, when he did, I can't begin to tell you how liberated I felt. My first suggestion is for you to see if it is at all possible to put a fence up in your yard. It doesn't have to be an expensive fence and it doesn't have to enclose the entire yard. When I was growing up, my mother had four small children and we moved around a lot. She was a firm believer in outdoor time for children. I think it was the only way she was able to salvage any sanity. When we moved into a new house, the first thing my father did was put a chicken wire fence up around at least a portion of the back yard. It was inexpensive and it served its purpose. Another suggestion I have is to do what I did when I lived in the condo, go for walks with your children. Even if you just plop the baby in the stroller and walk around the block with your children, you have accomplished something. You can have them take note of the trees on your street and other seasonal things that catch your attention. Can they find five signs of spring/summer/fall/winter? Does anyone see evidence that another living creature has been nearby? What kind of clouds are observable today? Sometimes, walking is more relaxing and purposeful than "sitting" there trying to keep several small ones within the constraints of the yard. You can take a basket for any interesting finds and maybe someone will want to be in charge of the bug box. I hope you are able to find a solution that is workable for you. Having a yard is a blessing in itself. I am sure that you will find a way to use it to your family's advantage. I've thought a lot about this over the past year as well. Summer heat is definitely a problem, and I'm sure even Charlotte Mason was restricted from venturing out at certain times of year. But I've decided that I want to get outside as much of the year as we can, so last year we began taking "puddle walks" in winter (in California), which I thought would make up for missing those 100 degree summer days. We all put on rain gear and tramped around in puddles, then came home for hot chocolate. Now we really look forward to rainy days! "How is Science handled (specifically lab sciences)--it looks like Apologia is used for the higher grades (jr. high and up)--is that correct?? I know nature study is always part of it, so for the younger grades, is it just our nature study rotation that's considered our science curriculum??" No, we've scheduled other books as well that fall within the various areas of science: Christian Liberty Nature Reader 5 (on the human body), The Story of Inventions (also a CLP book), Fairy-land of Science (online), It Couldn't Just Happen, Madam How and Lady Why (about earth science, online), Pagoo (one of the Holling books, about a hermit crab), the Physics Lab/Science Lab books by Friedhoffer (these are a little more on the fun side, but still well written), and several good biographies (in some cases, we've named the person but haven't found one "best" book to use yet). We also included Fleisher's Secrets of the Universe, which is a great book about physical sciences (even covers Einstein), but which has gone out of print in its original format since we chose it; if you can find a copy (try the library), it's excellent. "Can anyone share their family's nature study routine and give me some motivation? Or can someone share with me how they are using The Handbook of Nature Study to help with this area?" "I have owned The Handbook of Nature study for several years but have not implemented it. Please share ways you have put this huge volume to use." Now, during the term that you are focusing on...let's say birds...you will want to look over the bird section of HNS. Pay attention to which birds you are likely to see in your area. During your nature walks, pay especial attention to the birds. Where are they? Are they nesting? What are they eating? Are they alone or in flocks? Keep a list of the different birds you see during this term. Try to discover the names of birds you see, but don't recognize. Use the HNS to teach your children some basic facts about birds (such as all birds have beaks, feather, wings, and two feet, etc.). The HNS suggests using a chicken to study birds up close. If you don't know anyone with a chicken, maybe you have a friend with a parakeet? Your primary goal during the "bird" term is to heighten your children's awareness of the feathered creatures around them. Teach them to be very still and quiet while they watch birds. If it's the right time of year, put out birdseed. Of course, you will want to implement your nature notebooks during the term. Set a goal of drawing 5 or 6 different types of birds (use picture books to help you draw them--they move around too much). Put your list of birds into the nature notebook--it's not just for pictures. If you have a bird nesting close to your home, you might keep a journal and follow the progress of the babies. This could go in the nature notebook, too. You might choose to read to your children directly from the HNS (not about every bird, but perhaps a few that interest all of you), or you may just use it more as a "teacher's guide." When your bird term is finished and you move onto reptiles or something next term, you will find that the relationship your children developed with birds continues. At least, that has been the case at my house. I've been doing the "focused" nature studies for several years now, and the results have been pleasing. Once the children have their awareness heightened, they continue to notice birds, even when you are focusing on rocks and minerals. After a few terms of this, they begin to be aware of many things at once and get quite sharp at spotting items of interest! Now, one caution. Just because this is the "bird" term, it does not mean that you must limit your nature study exclusively to birds. That is your focus, so at least once a week, on a nature walk, you will want to be noticing them. But if the kids get excited about a wasp's nest, or a pretty flower, or a fossil...take advantage of their interest and draw or talk about that for the day. You have a whole term to "focus" on birds, so there's no need to tune out all the other interesting things that come up. 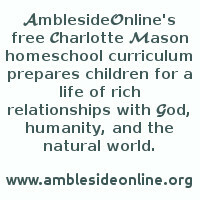 If you follow the AmblesideOnline rotation for nature studies in years 1-6, you will cycle through every section in the HNS. You will also do this if you follow the rotation for 4-6 only, where there is some doubling up. My suggestion is to pick a rotation and follow the same one for all your children. You can also take advantage of the "focus" to check out library books on your topic. My favorite "bird" book for the lower grades is "Tony's Birds" by Millicent Selsam. It's just an I Can Read book, so if you can find it, it's easy to add into your term's reading. Your kids will be excited about watching birds if they get to read that book! Nature Study should help the child delight, understand and be intimate with the outdoor world around him. It provides a basis for real scientific observation through developing theories and testing them through observation and possibly experimentation. It does not need to be complicated, just look for obvious connections, and your children should start to find some for themselves as they grow in understanding. Just start by observing. Walk around, sit still and watch/listen to what is going on around you. Just get outside and see what is there. After a time pick something, birds, trees, flowers, rocks.... to focus your study on and learn more about. I have a nature notebook for my son (6 yo) he does some free hand drawing (not very well) and sometimes we will trace outlines of birds... Just so he can document things we find and we write facts about whatever it is. We didn't start using a notebook until we had spent sometime just observing and exploring nature. I don't think it matters at an early age how well they draw but how well they observe what is going on around them and learn to identify the things they see and feed their curiosity. My son's curiosity gets him moving when he finds something outside or sees a new bird, he will look it up all by himself or bring it in and we will observe it for a while. We also will read books about whatever we happen to be studying at the time. Try different things and stick with what you enjoy and works for your children and you. "What was Charlotte Mason's attitude towards teaching science?" Charlotte Mason said that science should increase and feed our wonder and delight in the world around us. It should spark our admiration, both at the wonder of creation and the skill and wisdom of the Creator. It should put us on a first name basis, so to speak, with the natural world, which means we must know the names of the inhabitants and their surroundings, and it should introduce us to the laws that order our universe as well as the methods used to make scientific discoveries. That's a pretty tall order. It wasn't very easy in CM's day, either. She complained that science as taught "causes history to expire, poetry to die unborn, and religion to faint." Charlotte Mason's schools developed at a fascinating but problematic time in history, when science was becoming ever more important. Although the emphasis of CM education is often thought to be liberal arts with a splash of nature study, Charlotte Mason was equally interested in science as a subject. She wanted all students to have a broad base in topics such as botany, astronomy, and physiology, although the curriculum for the younger grades used mostly books on animals and other natural science, in addition to their own observations and collections. And most of all, this was not to be taught with a kind of Cold-War, utilitarian slant; science was to be taught as something wonderful in itself. (1) [Science] should lead to a knowledge of the properties of substances and of the forces in the world around us, what they are, and how they can be used for the benefit of man. This must be a knowledge of the things and forces; not about them. It must be obtained by personal experience. (2) It should lead to scientific methods of thinking, accurate observation, careful comparison of results, and the formulation of general principles. It should make the imagination quick to see possibilities, to suggest methods, to devise experiments to test their truth. (3) It should introduce to the living world of men and nature, a world of absorbing interests that will enlist our sympathy or arouse our enthusiasm, a world of mystery that fascinates with promise of discovery and fuller knowledge, a world of wonder and beauty that we cannot explain, but in which we walk reverently with uncovered head. But a Scientific training should also be a thorough drilling in accurate methods of thinking, and incredible as it may seem, this is often wholly absent from the teaching of science subjects to-day. And the reason is,that there is no time for it! "In addition, however, to its utilitarian value, in addition to its training in accurate thinking, every science subject has its romance, its poetry....why should we ignore the inspiration of science, neglect the mental training it offers, and reduce science to the equivalent of a collection of cookery book recipes. The world is too poor,and our lives too denuded, to allow the robbery to continue. Let us give to our children the greatness of their inheritance. Make every science subject the portal to a fuller and wider world." I think children today are in a different space, scientifically speaking, than Charlotte's students. They know more, they're actually bombarded with science concepts all the time. But the concept of creating wonder hasn't changed; I think that's still as big, if not bigger, a challenge than it was at the turn of the century--we have to be so careful that it's not reduced to something commonplace. Imagine the things we never knew about then, or were just beginning to understand--like discoveries in medicine and atoms, problems in pollution and agriculture. If we can recapture some of the wonder of those early explorers--that's what they were!--maybe that will bring back some of the interest we're hoping to spark. "I live in a new suburb without much nature. Would The Handbook of Nature Study work for us still?" -- Consider planting your yard with naturalising foliage, plants and ground cover which is indigenous to your area. This will attract creatures to your yard which are common to your region. -- Encourage butterflies and attractive moths to your yard. For example, the Orange Sulphur aka Alfalfa Butterfly (Colias eurytheme) seeks out plants such as alfalfa (Medicago sativa) and white clover (Trifolium repens).Plant some ground cover such as bushes and decorative grasses. Birds feel more secure when they can quickly flit to safety rather than exposed to any predators' eyes. -- Plant hummingbird / butterfly-friendly flowers in pots on your porch or along the side of your house. Library books will provide suggested plantings for your zone. -- Put up a wild bird feeder, either on top of a fence post or hanging from a plant-hanger stake (the same tall metal ones used for patio lanterns). -- Hang up a bird feeder from your house with eyebolts attached to the roof and side of the house. (This is what we did, to squirrel proof our bird feeder). Screw in an eyebolt from your roof overhang - in front of a window of course! Put in another eyebolt lower down on the side of your house, at about grown-up hand level. Thread the thin acrylic rope through the eyebolts, tie on the birdfeeder, fill it and pull it up to mid-window level. Knot the rope onto the second eyebolt - just enough to secure but not so much that you have to use a knife to get the rope undone. -- Set out a birdbath with fresh water. Change the water every other day. You can make a birdbath from a very large clay pot and saucer. Set the pot on the ground upside-down, place the saucer on top, set a flattish rock in it, pour in the water and it is ready for visitors. -- Buy a hummingbird feeder and hang it up. You really don't have to buy those expensive little packages - it is just light sugar syrup and very easy to make. Change the hummingbird feeder every couple of days (check a hummingbird book for specifics) as the sugar does go bad and could make the hummingbirds ill.
-- Place a large rock down and leave it there for a few days. Give the kids individual hand-held magnifiers to go on a bug hunt. Let them flip over the rock; it is surprising what insects will hide under there. -- Set outside a few plates with various types of foods such as sugar, salt, bread, apple. Over the space of a week watch which insects are attracted to what food item. (Wasps to apple, Ants to most anything!) Be careful to pick up the plates only when there are no insects on the food and dump it out into a plastic bag to be immediately put into your outdoor garbage can. -- Leave a porch light on at night and see how many winged insects are attracted to it. My 6 year old daughter enjoys counting the varieties and quantities of moths. -- From your public library, borrow reference books for birds, insects, flowers, plants, etc. Take a peruse and familiarize yourself with what you may find in your area. Thought I'd share what the kidlets are working on this morning for school--and for life. It's primrose time here in my part of the country, so I bought fifteen plants yesterday at the grocery store. Last night over dinner we discussed primroses and their growing requirements. This morning the girls decided which of two flower beds they wanted to plant in primroses. They took into account the growing conditions in each of the beds, their respective aesthetic values, as well as which one would be harder to weed and which they would have to water more often. Next, they weeded the bed, saving the weeds for educational purposes (get to that later), and learning an important and useful Lesson for Life--we do not pull up strawberry plants. Then I had each of them examine the primroses with a magnifying glass and carefully sketch the blossom, buds, and a leaf. I have found sketching nature observations to be very important, and not primarily for the artistic value. The more we do this, the more I see that sketching what we see is important because it forces one to look more closely at what one is sketching, and helps one to notice details otherwise missed. It was exciting to see that happen today. Although we had already looked at the flowers carefully (we thought) and even used the magnifying glass, it was not until we started sketching that the girls noticed that the different colours of primroses have different centers. We're not sure why. One of them also commented that just like one of the logic problems in the Zoombinis computer game, primroses all have to have some characteristics in common in order to be primroses. After they sketched and labeled their primrose portrait with its proper name (primula), they took turns arranging the fifteen differently colored plants into a pleasing arrangement. We have two or three pink ones, and the rest are roughly divided into two groups, one set with dark purply blue petals with yellow centers and the other yellow flowers with pink centers. The idea was that they were supposed to agree with each other on which arrangement they will use when they plant the primroses, which is the next step. However, after some friendly wrangling over which single arrangement was best, they asked if the 8 and 9 y.o. could have seven plants, the young teens have seven, and the toddler have one to plant in a cunning little duck planter which is just so cute we have to use it even if it means watering the thing three times a day, so that's what they're doing. After we transplant the primroses, we spread some newspaper out on the kitchen table, dumped the week collection out there, and began to work on weed identification. Newcomb's Wildflower Guide is not in color and it isn't a field guide I would have picked up, but I'm glad I have it. Somebody else taught me how to use it and it's indispensable in identifying flowering plants. You have to read the forward and introduction so that you understand how to use the key, but once that's done, it's quite simple. Reader's Digest North American Wildlife is the book to own if you can own only one. All the most common plants, animals, trees, and birds are found in that single volume. When the weeds are identified, we use Weeds and What They Tell to learn something about our soil, as some weeds indicate high acidity, others a nitrogen deficiency, and so on. Enature.com is another incredibly useful resource for those of us with access to a computer (which includes all our gentle readers, doesn't it? Otherwise, how would they be reading this?). After we identified as many weeds as we could, each of us selected a weed to illustrate and label in our sketch books. And saw the storms go by. they came trooping through the fields. And on it danced she. Of one small primrose flowering in my mind. One small page of Truth's manuscript made clear. I read it through the lenses of a tear. Moments to see wonders in the grass. I like to leave this portion of their journal up to the children. They can copy a poem I choose, or not. They can look up another poem they like better, or not. They can choose some prose selection about their subject to copy, or not. If they prefer, they can write out their own description of the item in their sketchbook, just so long as they use their neatest handwriting. We transitioned gently from nature study and botany into home economics as they cleaned the dirt and debris from the table, the detritus from the floor, vacuumed up the dirt tracked in on the carpet, washed the muck off their hands, cleaned out under their fingernails, and relaxed with a cup of tea (home economics). They have learned many useful and delightful things, gotten some fresh air and exercise, they have the satisfaction of a nicely arranged flower bed, and a nice entry or two in their sketch books. I have a cleaner house, a weeded and quite pretty flower bed, fun with the children, and some precious time with poetry. I love homeschooling! Indeed, 'Thou hast set my feet in a large room should be the glad cry of every intelligent soul...' as Charlotte Mason said, and we have handled the treasures of a very large room today.